Nelson Simmons returned from the minors in 1985 and went on a tear. In a week of games, he hit four home runs and knocked in 11, United Press International wrote. "Going down was the best thing for me, I think," Simmons told UPI. "I can just go down there and play every day and concentrate on my hitting." Simmons played that year in his second season in the majors. He saw just one more, as the best thing for him turned out not necessarily being sent back to the minors, but focusing on other issues. Simmons' career began in 1981, taken by the Tigers in the second round of the draft out of Madison High School in San Diego. He started that year at rookie Bristol, moving to single-A Lakeland for 1982. He hit .293 on the year there. That July, he told The Detroit Free Press of frustrations with pitchers. "I guess I got my bat known too soon," Simmons told The Free Press. "They're not throwing to me, they're throwing around me. I'd rather be somewhere where the pitchers will challenge me to see who's the best." 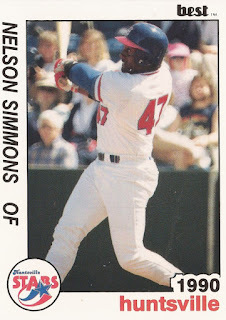 Simmons made AA Birmingham in 1983, then AAA Evansville in 1984. Simmons also made Detroit in 1984, getting into nine games that September, going 13 for 30. Simmons returned for 75 more games in 1985. He hit 10 home runs and turned in a .239 average. He moved to the Orioles in mid-1986 having been released by the Tigers after assault allegations later dropped. He played the year at AAA. He saw his final time in the majors in 1987 with Baltimore. In 16 games, he hit .265. He then moved to the Mariners in a trade, playing all of 1988 at AAA Calgary. He started 1989 with the Cardinals at AAA Louisville, but the Cardinals soon released him after he admitted to using marijuana. Simmons, however, continued on. He played the rest of 1989 in Mexico, 1990 and 1991 with the Athletics at AA Huntsville and AAA Tacoma. In spring 1994, he hoped to make a comeback with the Angels. He told The Los Angeles Times of his hopes for a fresh start. "I almost wish I could change my name and go play baseball where nobody knows me," Simmons told The Times. "People have long memories in this game, and unfortunately, they still remember the bad things about me." Simmons never made it back to the majors. His final time in affiliated ball came in 1995 with the Pirates at AAA Calgary. He then played in independent ball. His final time as a pro came in 2000 between independent Tri-City in the Western League and in Mexico.